First up is the TP-Link TL-WN721N, it’s the least expensive on our list but doesn’t skimp on functionality. It can connect to WiFi b/g/n networks, and supports speeds upto 150 Mbps, which should be more than enough for now. A 3 year warranty, good build quality and range of upto 30 meters mean that this WiFi adapter is fantastic value for money. The best part is that if you don’t have a free front USB port, it comes with a USB wire that lets you extend the port. Belkin is one of the most well known names in the networking business and their WiFi adapter is one of the best buys in the low budget range. It has all the features you’d want, including support for WiFi b/g/n networks and speeds upto 150 Mbps. Just as the TP-Link one above, there’s 3 years of warranty as well. Range is also pretty good at 30 meters or so, plus it lets you create secure WiFi networks like the other WiFi adapters on this list. Digisol isn’t the name that strikes you when you think of network components, but it’s gaining traction slowly. 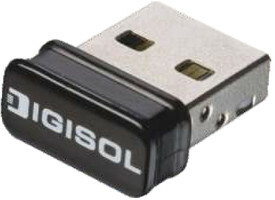 The Digisol Wireless 150N USB adapter is the most compact and easy to use of the lot and works well on older OS’es as well. Feature set is pretty much the same as the other two on this list, save for the fact that it has lifetime warranty, which should sway some people’s opinions. You can expect range of around 20-25 meters or so. Those were the most inexpensive ways to let your desktop PC get wireless network capabilities, let us know if you have any more additions to this list! Rahul,great work dude ! cud u help me i wished to buy a 3G dongle then came to know that 3G+wifi dongles are also there but their price is doble ! thinkin abt future cud u take me out of this dilemma? Yeah go for it if you really need it.